Today's inspiration comes from British designer Tom Dixon, who has given his name and furniture to a new London sandwich spot. 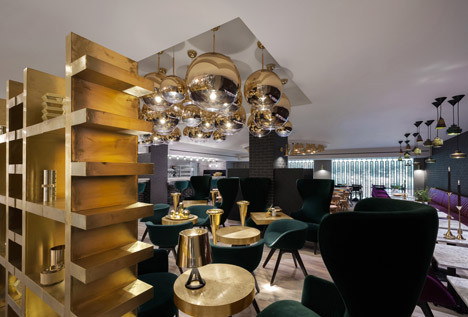 Dixon and his design team were inspired by London nightclubs and drew in dark shades of blue, green, and purple to create a stunning interior. The space is divided into three sections by strategically placing different lighting, colors, and styles. The cafe is open from breakfast to dinner and the menu has mainly classic British foods with its own little twist...but let's be honest- who's really coming here for the food?? ?